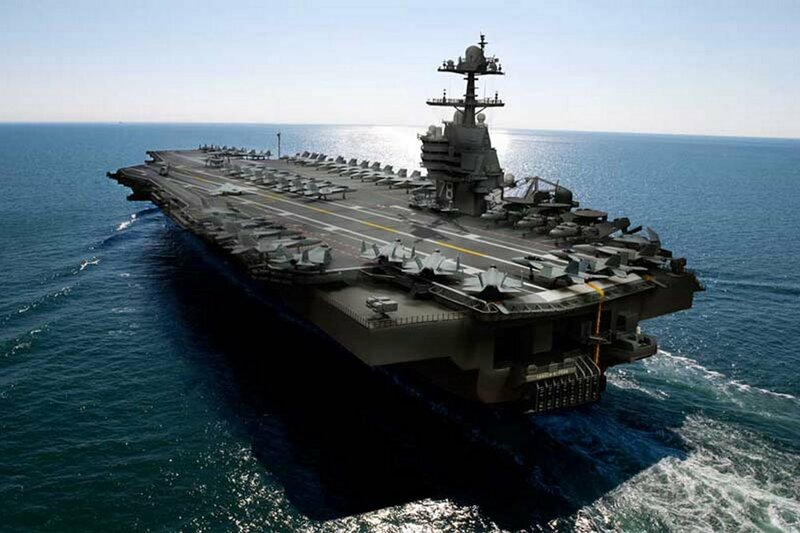 The USS Gerald R. Ford is the first in a new class of aircraft carriers which will slowly replace the Nimitz-class of carriers currently prowling the world's oceans. 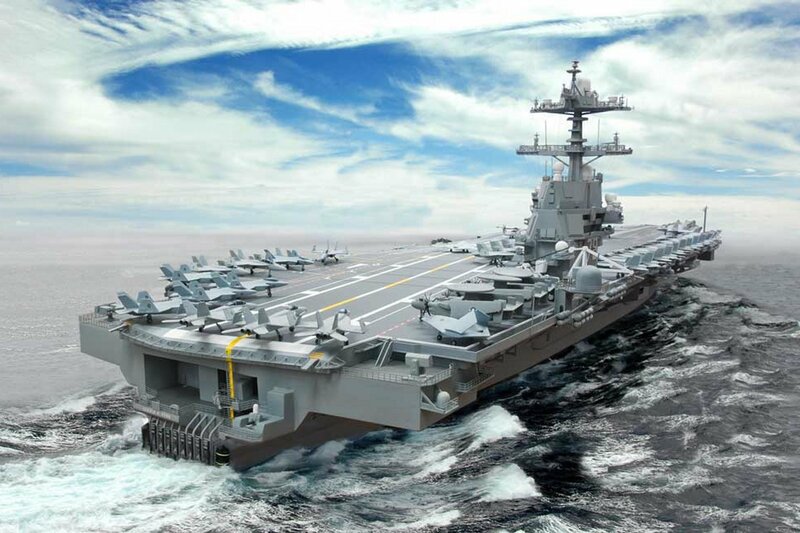 The USS Gerald R. Ford is scheduled to enter service in 2016, although as with any new and highly complex military hardware, schedules are almost always overshot. In fact Admiral Greenert, the Chief of Naval Operations has already said a 2018 date is more likely. 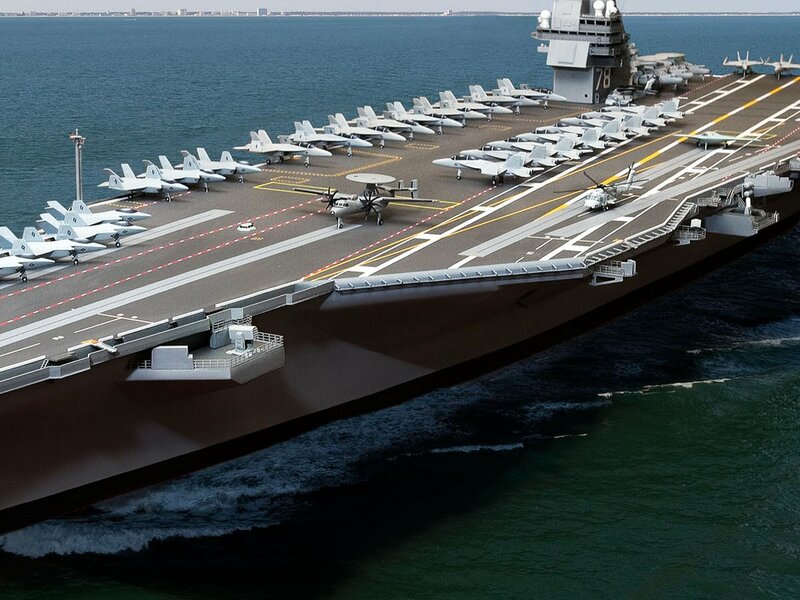 The other carriers with a scheduled build date are the USS John F. Kennedy (scheduled for a 2020 commission), and the USS Enterprise (2025). 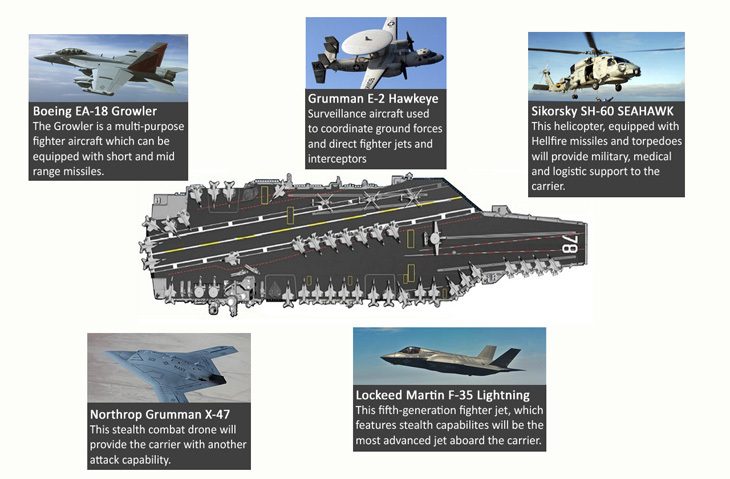 Ten Ford-class carriers will be built by the end of the program. The carrier's cost is an estimated $12.8 billion, with a further $4.7 billion having been spent on research and development. 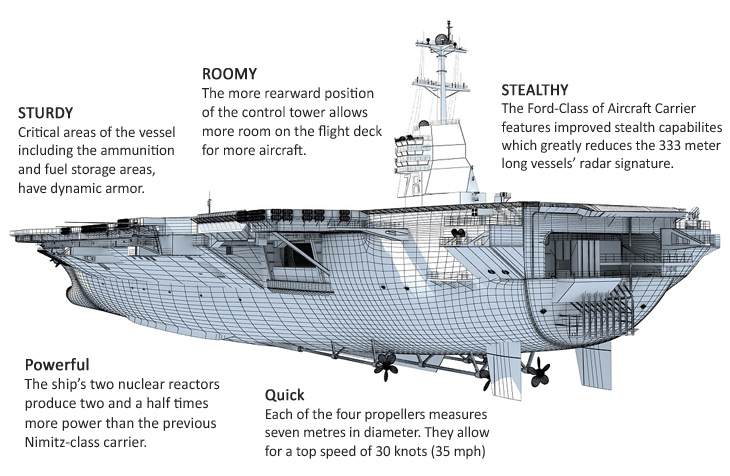 It is one of the most sophisticated and expensive pieces of military hardware ever built. It is said that the USS Gerald R. Ford has double the combat power of all the warships deployed during world war 2 combined! It will be capable of carrying over 100 aircraft on its flight deck and internally, although the standard complement is less. The USS Gerald R. Ford will carry an assortment of aircraft, including fixed wing aircraft, helicopters and UAVs. The standard aircraft types carried aboard will include the Boeing F/A-18E/F Super Hornet, Boeing EA-18G Growler, Grumman C-2 Greyhound, Northrop Grumman E-2 Hawkeye, Lockheed Martin F-35C Lightning II, Sikorsky SH-60 Seahawk helicopter and the Northrop Grumman X-47B stealth UAV. 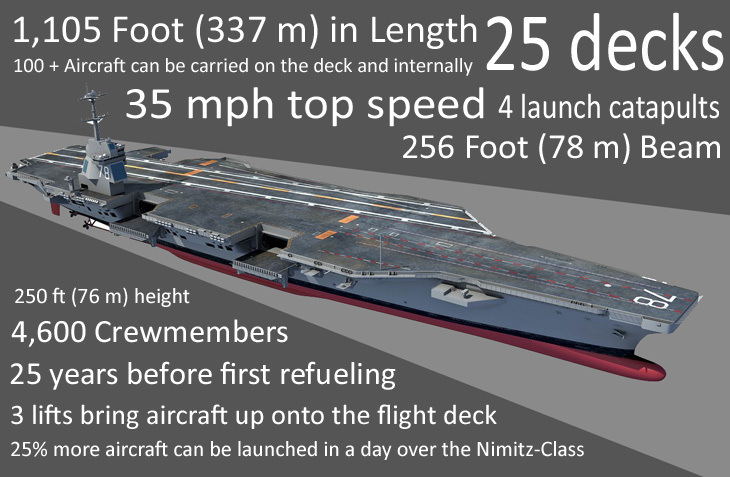 Despite the added size and aircraft carrying potential of the carrier, it will have a smaller crew complement than the Nimitz-class of carrier. with 508 officers and 3,789 enlisted men. The reduction in crew, and the automation of many systems as well as improved overall efficiency is intended to reduce running costs. It will still cost somewhere in the region of $100 million per year to operate. - A new nuclear reactor design (the A1B reactor) for greater power generation. Two reactors are fitted to the carrier. - AN/SPY-3 dual-band radar (DBR), as developed for the Zumwalt-class destroyers. - An Electromagnetic Aircraft Launch System (EMALS) in place of traditional steam catapults for launching aircraft. - Stealth features to help reduce radar profile. - The updated RIM-162 Evolved Sea Sparrow missile system. 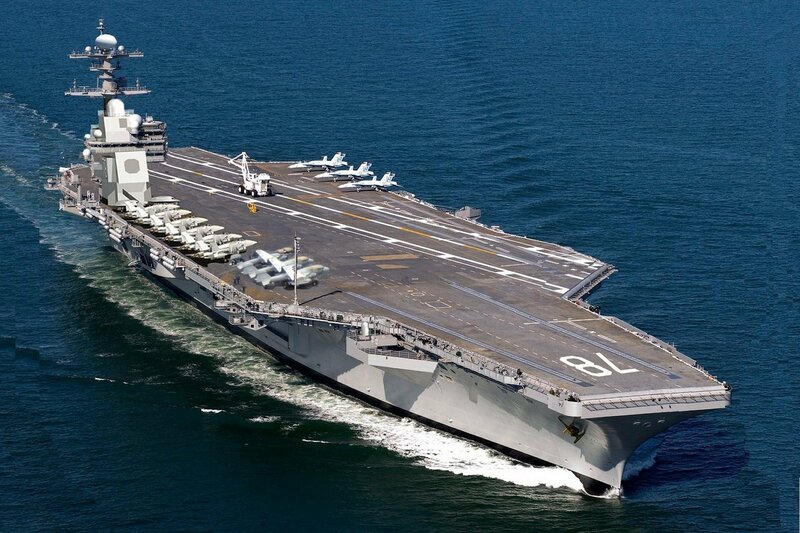 - Advanced electromagnetic arresting gear instead of hydraulic arresting gear. One of the major structural redesigns over the Nimitz-class of carrier is the smaller and redesigned island. It has been moved further back, creating a centralized area for rearming and refueling aircraft on the flight deck. In addition the re-routing of weapon delivery systems and elevators from the stores to the flight deck saves time when quickly rearming and refueling aircraft for a fast turnaround. The USS Gerald R. Ford, and other carriers in the class have also been designed to accept weapons systems and other advanced technologies which are yet to be brought into service. Including laser directed-energy systems, high-powered tracking systems and dynamic armor. The huge power generation provided by the two onboard nuclear generators provides more than enough energy to supply these systems if, or when, they are added. While the USS Gerald R Ford is the first in its class. Nine additional vessels are scheduled for production, the final carrier has a build date of sometime after 2040.